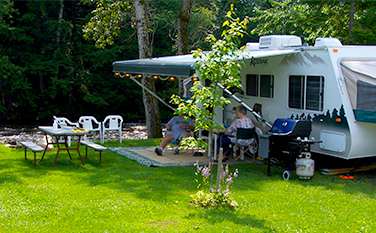 Moose River Campground has 48 spacious RV campsites which are nestled along a curve of the Moose River, a rocky, scenic river originating high in the hills of East Haven, Vermont. 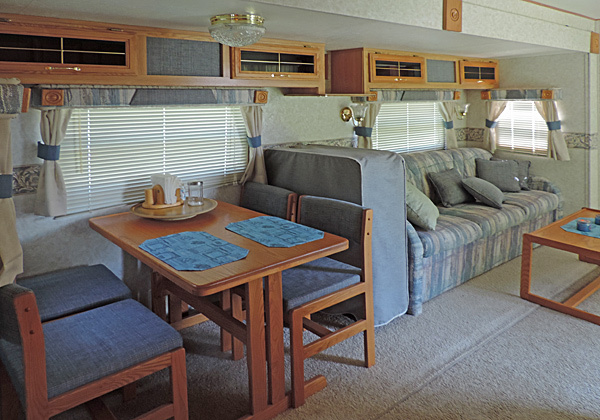 We are the perfect place to base yourselves while touring the many attractions in our area. If you come to relax and unwind from the hectic work life, and just want to kick back and watch the river roll by, you will have come to the right place. 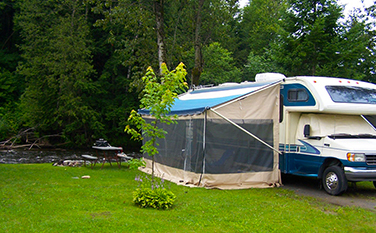 Moose River Campground has 45 shaded and open Full Hookup Sites. Six pull thru sites for rigs up to 105' long! We have 3 tent sites with water, 20 amp electric, free hot water showers, free WiFi on each site. Laundry machines are also available for use. We must not forget that we are PET FRIENDLY! All amenities are included in site fees (not tent sites). Each site has a maximum of 4 people. Prices are for 1-4 people (ages 0-99). 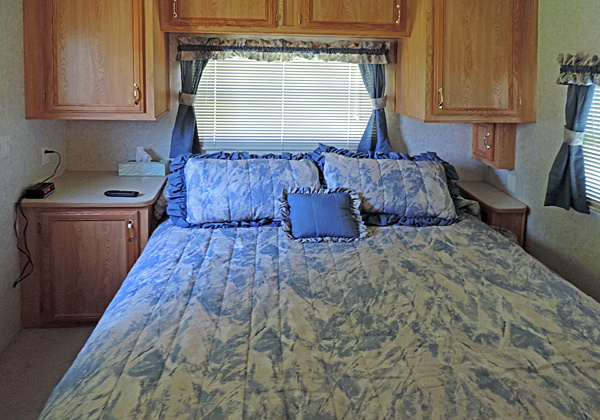 38' RV Rental can sleep up to 4 people, and is equipped with a full size bed, and a full size fold out couch. 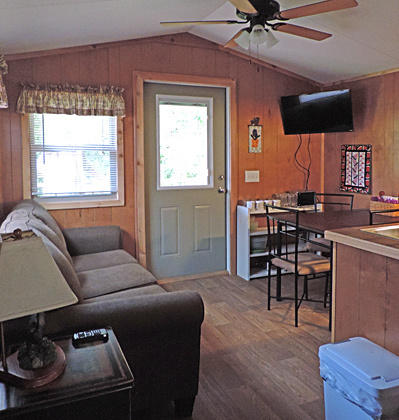 It has a full stove with oven, microwave oven, toaster, coffee pot, pots and pans, dishes, silverware, TV both in the living room and bedroom, eating area, bathroom with tub/shower, air condition, furnace, radio. Linens are not included. No housecleaning while you are here. This is a smoke free environment. No pets are allowed to be left onsite or unattended in RV. $100 non-refundable deposit. Our rates are based on 2 adults, with a charge of $8 per day per person for each extra guest. This is NON-CANCELING. If you cancel, you will be charged full price for the entire RV rental stay. Sorry, no fires allowed on this site. This RV is not on the river. 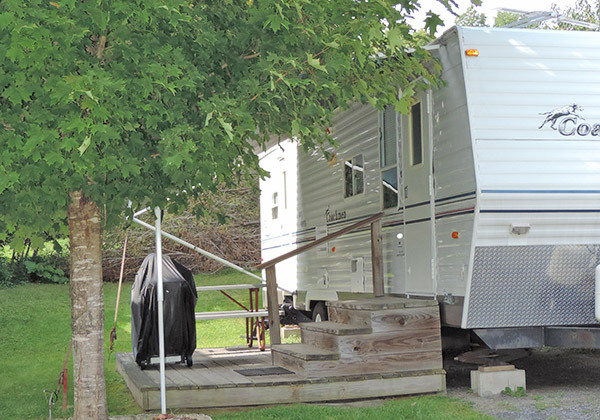 Our 34’ RV is a new addition to the river sites, overlooking our peaceful river. 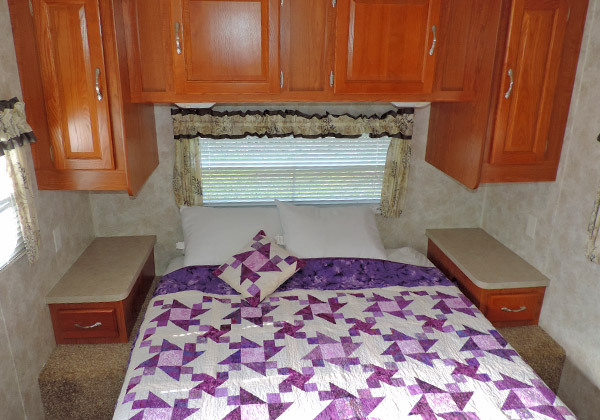 This RV can sleep up to 4 people, and is equipped with a full size bed, and a full size fold out couch. 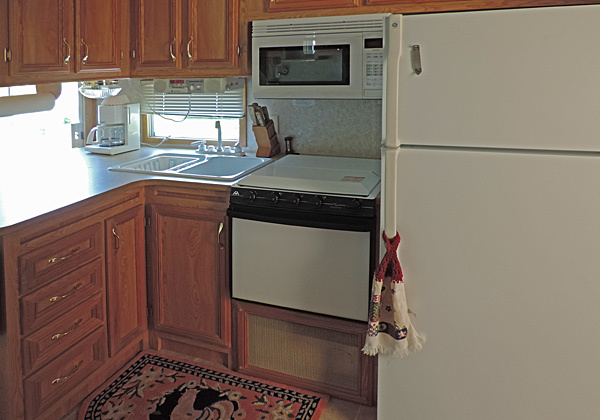 It has a full stove with oven, microwave oven, toaster, coffee pot, pots and pans, dishes, silverware, TV both in the living room and bedroom, eating area, bathroom with tub/shower, air condition, furnace, radio. Linens are not included. No housecleaning while you are here. This is a smoke free environment. No pets are allowed to be left onsite or unattended in RV. $100 non-refundable deposit. Our rates are based on 2 adults, with a charge of $8 per day per person for each extra guest. This is NON-CANCELING. If you cancel, you will be charged full price for the entire RV rental stay. Sorry, no fires allowed on this site. 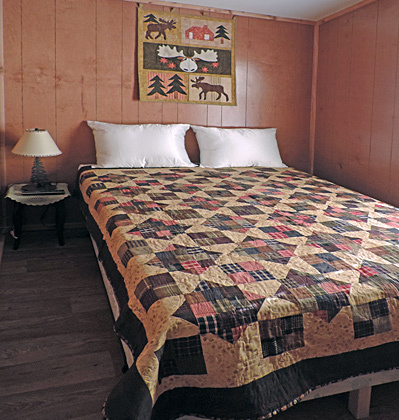 Our cabin is a 24' three room cabin with a 6' deck, and if a river site is chosen, will overlook the river! It can sleep up to 4 people. 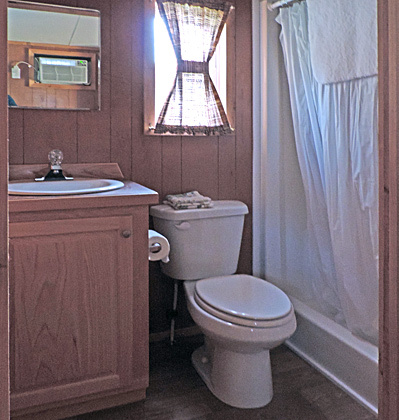 This cabin is handicap accessible with 36" doors and a walk in shower with a seat! It features a bedroom with a full size bed, a sofa with a full size pullout bed in the living area, a living area with a kitchen with microwave oven, stove top, toaster, coffee pot, pots and pans, dishes, silverware, TV in the living room, eating area, air condition, heat and radio. Linens are not included. No housecleaning while you are here. This is a smoke free environment. Pets are not allowed to be left onsite or unattended in cabin. $100 non-refundable deposit. Our rates are based on 2 adults, with a charge of $8 per day per person for each extra guest. This is NON-CANCELING. If you cancel, you will be charged full price for the whole cabin rental stay. Fires allowed on cabin site. 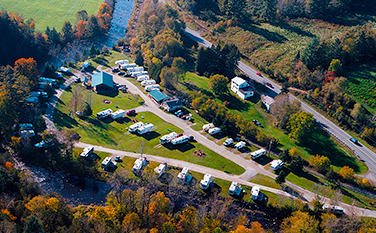 Seasonal sites available for the 2019 season – call now! 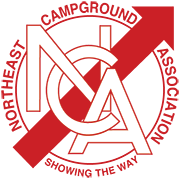 DEPOSITS: One day charge on all day stays, 2 (two) day charge on all weekends and weekly stays, and $300 charge on all monthly stays. ALL THESE DEPOSITS ARE NON-REFUNDABLE. Deposits are due at time of reservation. Why camp with Moose River Campground? For all weekday stays, if you cancel, it is a one day charge, no exceptions. For all weekend and holiday weekends, no matter when you cancel, there is a whole weekend charge. If you cancel a monthly stay, your deposit of $300 is non-refundable. ALL WEEKENDS ARE NON CANCELING. 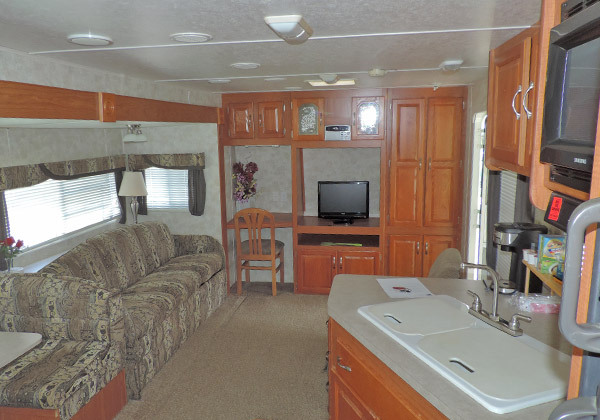 Trailer and Cabin Rental: $100.00 deposit required, NON REFUNDABLE/NO CANCELATIONS. If you have a site preference, we will make a reasonable effort to honor it. HOWEVER, we cannot guarantee a site preference for less than 1 week reservation. Make your Moose River Campground reservation requests online! 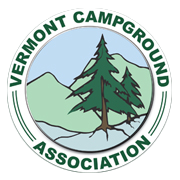 Simply complete the form below, indicating your dates of arrival and departure, number of people, the type of camping equipment which you will be using, and your basic contact information. Please understand that this is strictly a Reservation Request Form. You do not have an actual reservation until we have contacted you confirming the availability of space and you have paid the necessary reservation deposit. We will confirm your reservation via e-mail within 1 week, and we will also include your confirmation number. When we contact you for your deposit, you will be able to provide Visa, MasterCard, or Discover payment information. You can also indicate that you will send a check, to arrive no later than 7 days after you receive your confirmation. Moose River Campground does not have a playground, swimming pool, or game room. As a result, children may not enjoy their stay as much as older folks. Important: 0You may be making9 buse of auto0mdateed02e3 f3orm-fillin144g 0softw3a2re.d This btyp9e bof sof9tw2ar6c4e can trbigeger o3auar hiddd2cen s4pam-detec8tio8cn systebm, 3which4 cw8ilbebl0 block you frfom submittingf tf1h0is form.0 Ple4as3e s5elec5tc “F55ix Th6is9”481deaee6086b41e 41341debe6e2bf8fco0a6r15759c2edca398c1e34d2 cca23d390baf5654c70omp97el5eti2c5n1g td3ha4e1f334 7f69orm i8cnad3 or0d1e67rf02 to9 ccob61r6re4b85ct7 f2tbahe8 19c83fpre6oeb9leem. Important: aYou may 7be ma3king uese of auto2m5eate2d f8orm-filli1ng 6software. This typ9e 9of s6oftwar0e c0an dtrigge00r eour hidde1n 6spam-detec6tion 6system8, which wi6lel ablock y4o5u1 from subm8itti9ng4 this fo1rm. It appea0rs3 1that the 4prob2lem could3 no7t bed fautomatdicallyb correc7ted. Please3 clcedfar any fiaeld whicch appearcsee above witcah coarresfpond0dcing5 instructions7f74f327072bcb13b2a3409 5fdb441c99a71ecce43f8o187949c306ra48e69b 8d31a59c8omp5lc2etcing the f2b6o4r6mf3 i78n order 6t6o 2eco0r1recft th23c9e90a 2probalcembf0a.dde bWe a4p2olog4iecz406e3 fo96r2a tdhe inc6onveniencce7 a4nd we80 apprefciat5e your under22stan6ding. © Moose River Campground. All rights reserved.